SKIP the SoBe Wine & Food Festival! 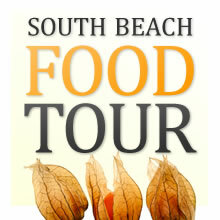 Take SoBe Foodie Tour! White tents erected on the beach like giant sugar cubes are the telltale signs that the SoBe Wine & Food Festival is underway. One of the most coveted star-studded events in South Beach that draws people from across the nation, rich people. Going back to its origins, the festival offered sampling of foods from Miami's finest restaurants and wine labels under one big tent. Tickets were an affordable $75 a piece. Even then the lines for each station serpentined like a tangled necklace and the attendees bumped elbows along the way perhaps stumbling from over indulgence of wine and bubbly. Much has changed since those days. Today, tickets are a stratospheric $300+ for the Grand Tasting village. Other private festival events will torpedo your recessionary budget into a bleak depression. What's all the fuss? The Food Network is now the sponsor of the festival which means a swarm of celebrity chefs descend into Miami. Bobby Flay, Rachel Ray, Emeril Lagasse, Paula Deen and others. Sure I enjoy these chefs and still have all the ingredients collecting dust in my cupboard for a red cake recipe from Paula Deen. But let's face it, who has time? Although I love Rachel Ray's 30-minute recipes which fit my busy lifestyle. But my sofa's distance from my 40" flatscreen fulfills my celebrity-proximity need. Moving onto the Grand Tasting village, upon entering say hello to Mr. Elbow again. A little pushing and shoving is expected. And yes, you paid a handsome price to be treated like a sardine. SoBe Dinner Food Tour conducted by the Miami Culinary Tours. The intimate group of 6-10 people are lead by a professional foodie tour guide walking the "strip" and taking you into select buildings and restaurants for a sample of food and regaling you with stories of people and history, past and present. It's more than eating. It's learning, it's entertaining! And it's only $59 a person. Ready for more? 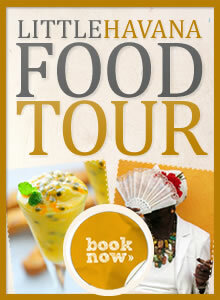 Try their Little Havana Lunch Tour. Discover the flavorful (not spicy) authentic Cuban food in this tiny pocket of Little Havana. Walk by the fountain of youth for elderly Hispanics--Dominoe park where you must be at least 55 years young and a resident of Miami to play dominoes. It's serious business all day long. For me, it's about tasting the fine food and wine of Miami. I gladly give up the bustling crowds and the bank drafts of the festival and choose a leisurely walking tour to pamper my tastebuds and let others cater to me!